It’s been some time since I posted anything on this site (over 4 months in fact). There could be any number of reasons I could come up with as to why that is. The truth though is that I’ve had my head down on a large cloud project (lots of vRO and vRA) for the last 6 months and a great many things have taken a back seat to it. Whilst the project isn’t over yet, I did manage to have some much needed time off recently and have been catching up a bit since. Part of that catching up involves cherry-picking from the long list of articles that I wanted to / started to write and getting them out of the door. Just a quick one to congratulate my co-author of this blog, Jeremy, and his wife on their membership of the “new parents’ club”. Baby Bowman arrived last night weighing in at 6lbs 9oz (about 3kg). Every now again people have to go back on a decision that they’ve made and make a U-turn. At VMworld in Barcelona, VMware have announced a reversal of their decision earlier this year to discontinue the sale of ThinApp as a standalone product. After December 15th 2013 it would only have been possible to purchase ThinApp as a part of the Horizon Suite but these plans have now been binned and ThinApp will continue to be available as a standalone product. To be honest, I didn’t know about the original announcement when it happened but it’s nice that VMware have listened to feedback and changed their stance. VMTN Subscription anyone?? ThinApp has been a version 4.x product almost since VMware acquired it in 2008. On Wednesday at VMworld version 5.0 was announced and it is expected to be generally available from the end of October 2013. With a major version bump like this you’d rightly expect some significant changes. Perhaps the most significant of these is the inclusion of support for virtualising 64-bit applications. There have also been some architectural changes to the level of virtualisation to increase and simplify application compatibility. Together these two enhancements are likely to mean that a greater range of applications can be virtualised – something that might have held some organisations back from adopting ThinApp in the past. One other thing that we can apparently look forward to in ThinApp 5.0 is easier integration with persona management solutions. Great for Horizon View projects! 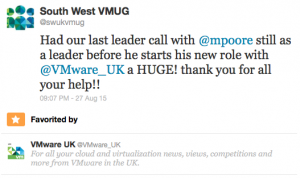 Check out the full list of changes on this VMware blog posting. For many I suspect, this will be a welcome and maybe long overdue release. From the end of October 2013 (or thereabouts) vCenter Operations Manager for Horizon View is to be included as a part of VMware’s Horizon Suite. Presumably this move is intended to act as an incentive for existing and potential EUC customers to adopt the entire Horizon Suite rather than build solutions that rely on only a subset of the components.